In Oman, the port of Duqm is to commence the export of minerals as of February from its breakbulk terminal. 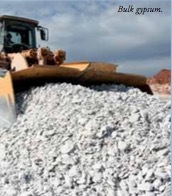 The initial commodity will be dolomite, for which capacity exists to handle consignments of up to 50,000 tonnes. According to CEO Reggy Vermeulan, the terminal potentially could generate volumes of 5mt (million tonnes) as part of its first phase development, although this could be scaled up substantially in the future. He said that there is huge potential for mineral exports from Oman, which wishes to reduce its dependency on oil revenue. The CEO explained that the port is working with Oman Railway ramping up the amount of mineral exports that could be brought into the port area or stored nearby. The two organizations have recently signed a memorandum of understanding, which will see a better connection and also the development of our support cluster on industrial land near the port. Oman has various minerals that it can export, including limestone, for which India is a very important market, gypsum and silica sand.